CPR level HCP and AED is considered the most comprehensive workplace approved cardiopulmonary resuscitation (CPR) program obtainable. Individuals that have previously acquired this award can easily re-certify this award via Windsor First Aid. This specific workplace approved program is good for Health care provider CPR and AED renewal and does not include any first-aid recertification. CPR level HCP re-certs take around 4 – 5 hrs to finish and passing Individuals receive a renewal certificate which fulfils the equivalent accreditation specifications as compared to the initial certificate. Candidates must satisfy a number of prerequisites before registering into the training course. To register for a re-cert course, browse to the bottom of the page to pick the lesson time, date and location of the course you wish to register for. Candidates Applicants must have passed the previous CPR level “HCP” accreditation training course within Canada St Mark James training provider / provider. Participants Candidates need to have passed the previous CPR level HCP and AED certification program in the past three years. If Individuals do not meet these mandatory prerequisites they must re-take the full CPR level HCP and AED certification course. Participants that finish the class get a Cardiopulmonary resuscitation level HCP certificate. This unique award is current for 36 months and meets many different school, employment and legislative standards. The price of the renewal lesson is — and takes approximately four or five hours to complete. 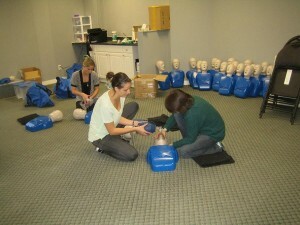 Windsor First Aid proudly offers the most affordable rates in the Windsor area. Class teaching lengths are provided and mandated by the workplace approved. In order to register into a Cardiopulmonary resuscitation HCP re-certification program pick the training course starting time and date out of the selection listed below and fill out the class enrollment form. Private lessons are offered for Health care provider CPR and AED renewal. To schedule a private program contact us through telephone or e-mail. If you have any questions or concerns regarding CPR HCP re-certs please let us know through telephone or e-mail.